My newest work is a teaser poster for the latest in the Jurassic Park series of films, Jurassic World. It's 24x36, 7 colors, 1 metallic and printed on black paper by Martin Hammond at Diamond Hill. The regular has a run of 500 and will be handed out during San Diego Comic Con. For more info, Text JURASSIC to 834567 for updates on when and where to pick up the poster at SDCC... it also may be a good idea to follow @JurassicPark on Twitter and @JurassicWorld on Instagram. The variant will be an edition of 100 and will be distributed online... I'm not sure how that will work, but I do assume you will want to be following @JurassicPark on Twitter. There will also be a charity auction for the original art produced while making this print. 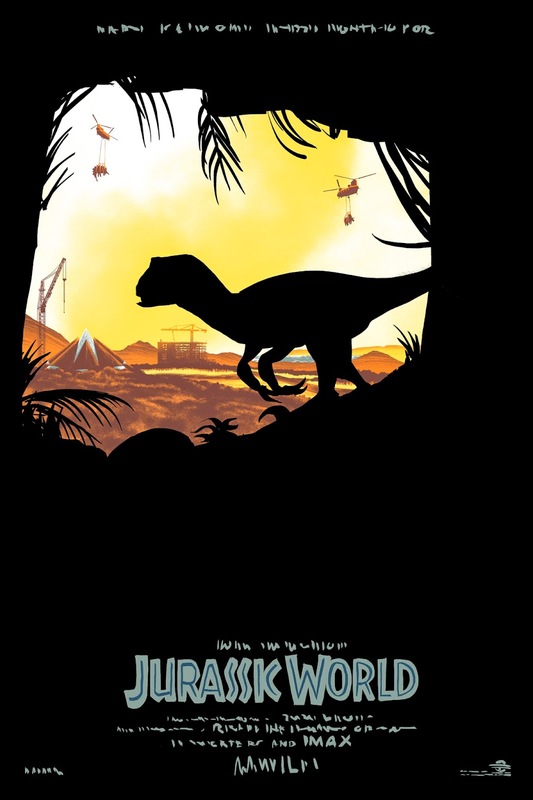 A couple of months ago, Universal Pictures contacted me out of the blue and asked if I'd be interested in working on a teaser poster for Jurassic World. I normally don't do posters for films I haven't seen, as I like to nail the feel of a movie, or at least an iconic scene, in one image. Chris told me I'd get access to to some of the concept art and maybe even get to chat with the director, Colin Trevorrow to get a feel for what the film is going to be straight from the source. So, being a huge fan of the Jurassic Park series, I decided I may as well dive in. It took some time to get a look at the materials from the movie, so while I waited, I decided to try and come up with a concept on my own. I'm a huge Disney nut, so the name, "Jurassic World" immediately conjured "Disney World" in my head. 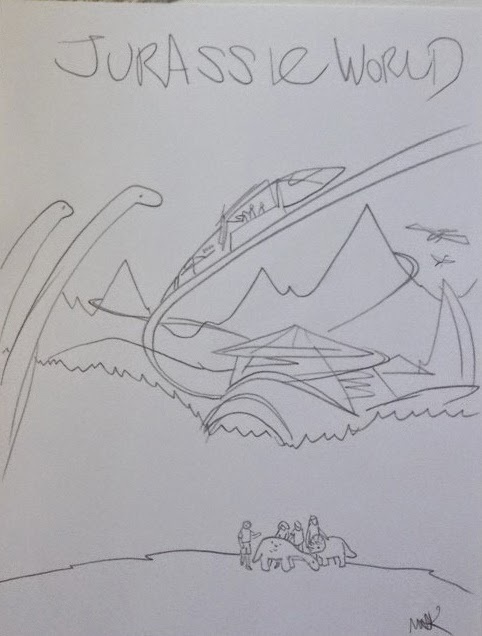 Along with everyone else who follows movies online, I saw those concept art photos that were floating around and noticed a monorail going around the island, which further solidified the connection in my head. The first idea I came up with was a take on a vintage Disney World ad, incorporating their iconic, "monorail swoosh" into my design. In order to get families to feel safe going to this park, I figured any sensible advertiser would show kids happily interacting with baby dinosaurs and tourists snapping pictures of a curious Brachiosaurus. When I eventually did see the actual concept art, and exchanged some emails with Colin, it became clear to me this first idea wasn't going to work. Also, I found that as a Jurassic Park fan, the image didn't really stir up much excitement for me... it also didn't help that the idea felt thematically a bit too close to Kevin Tong's awesome Jurassic Park poster. After milling over what I'd like to see as a fan, I decided to try and incorporate elements from the previous movies and try to connect how they have led up to the newest story in the series. Jurassic World takes place back on Isla Nublar, where the park from the first movie failed before it even opened. I wanted to subtly establish the setting, the theme of nature overtaking technology and that a new park with a new story was being built on what had come before... I also just wanted a cool shot of a Raptor. 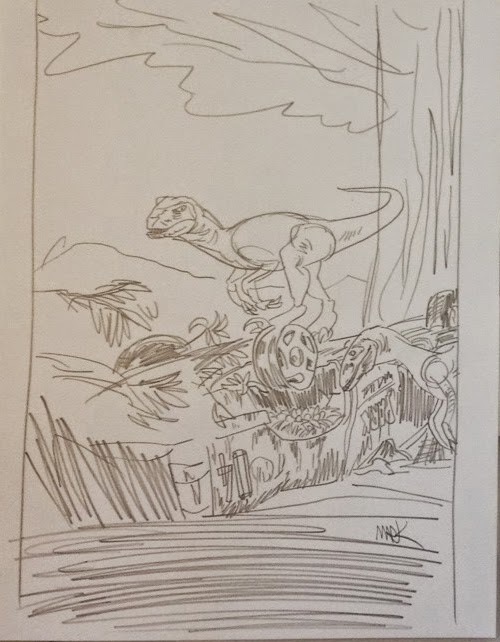 Above is what I came up with... A Raptor having built its nest in the wheel well of the crushed Ford Explorer that fell out of a tree, almost killing Dr. Grant and Tim in the first film. In the background, the new park is slowly beginning to take over the island. I submitted the idea to Colin and he liked it, with a few additions and guidelines from Mr. Trevorrow, I was off to the next step. I enjoy drawing dinosaurs, I drew them a lot as a kid... I know the canon Jurassic Park Velociraptor is way too big, and is more likely a Deinonychus, but whatever... Amphibian DNA can do wacky things. I drew this on big paper, 15x20, knowing that when I scanned it and shrunk it down I'd get a lot of implied detail out of it. This is my first 24x36 poster and I wanted to make sure not to wuss out on the fidelity of the image. 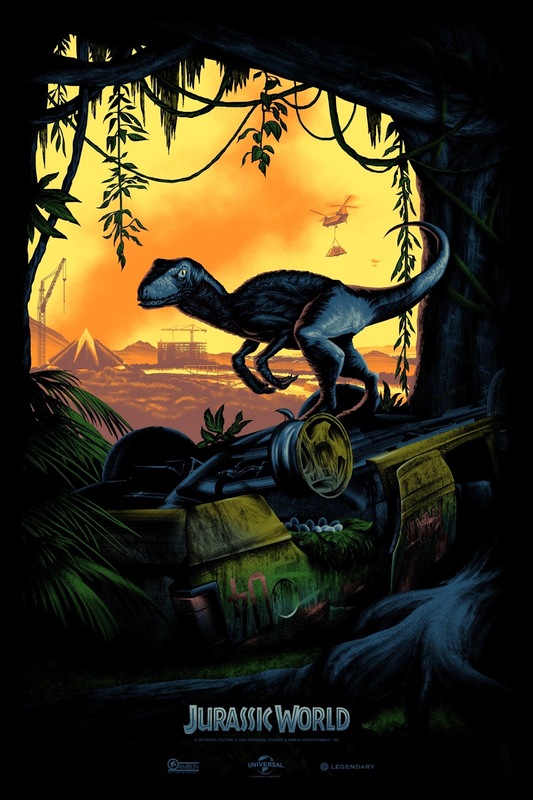 While I worked on my Raptor drawing, I started work on the background, figuring that would be the element of the poster most open to scrutiny as it contains elements from the new movie. I drew the main building I noticed in all of the concept art, figuring a construction crew would want to establish a secure base camp right away. Once that building was more or less complete, the crew could then clear the rest of the forest and start building other structures as well as lay down the monorail track. 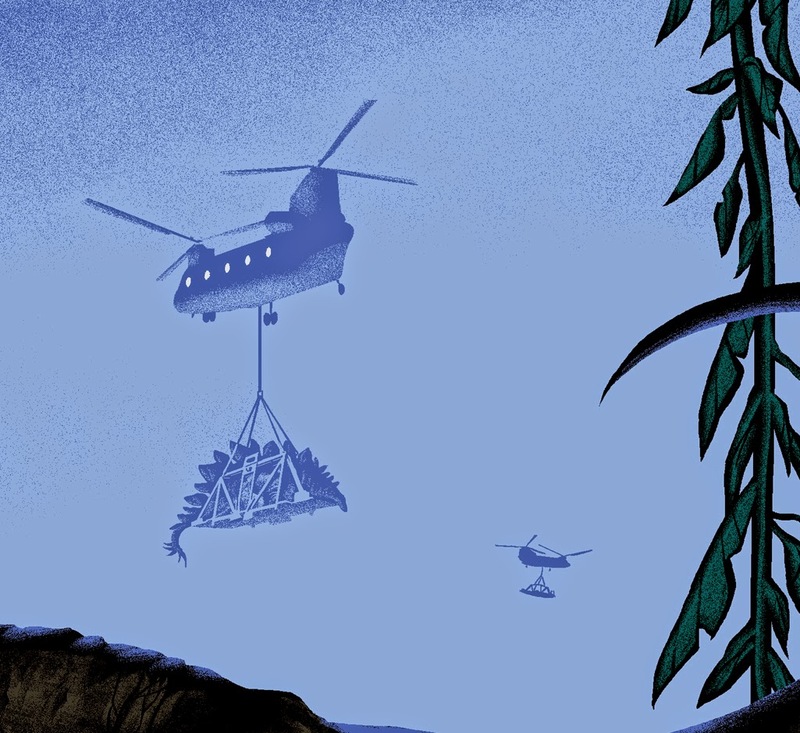 I had helicopters air lifting dinosaurs, I figured either they were stragglers or injured dinosaurs that couldn't be effectively herded. Colin suggested I used the harness they used for the T-Rex in Lost World. Which I thought was a really cool callback. 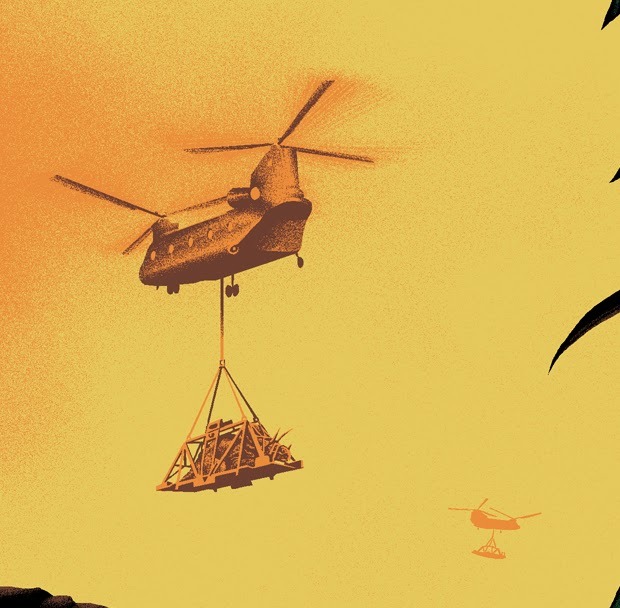 I took out one of the the helicopters because the arrival of a single dinosaur is treated as such a tense event in the previous movies, that it seemed like poor planning to have two arrive at once. I did bring the stegosaurus back in the variant, though. I also started blocking in the jeep and I removed the color white... I figured I would need to replace the white color(which wasn't adding much of anything), with a muddy yellow color to get that Jurassic Park Ford Explorer looking more on model and recognizable. Boy am I glad I added that muddy yellow color. At this point I had slaved away getting the details of the Ford Explorer right and rendering tons of leaves. I just had to draw a few more plants stuck in the undercarriage and that was that. I really have to thank Colin Trevorrow. He was an invaluable resource and I can't thank him enough for being extremely available throughout the whole process. I also want to thank Chris Johnson at Universal for bringing me on board for this project in the first place... it turned out to be a real dream come true. Best of luck to everyone going for one of these in San Diego and online. 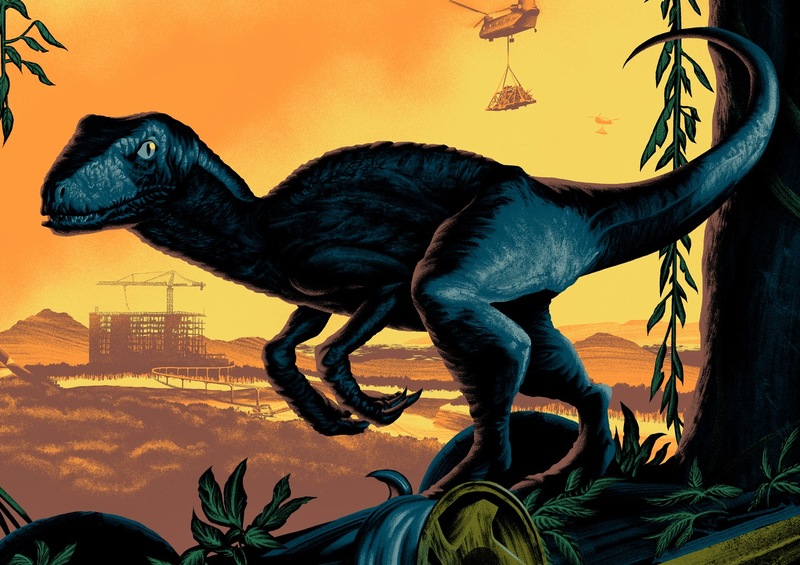 Nobody could've predicted that I'd have collaborated directly with a studio and movie director on a teaser poster for a Jurassic Park film. That's, that's chaos theory. What is written on the top of those two artworks? 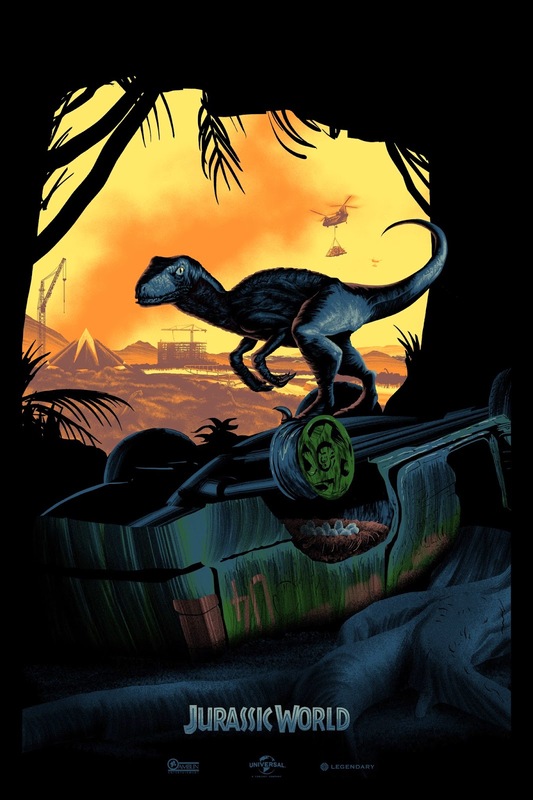 Gorgeous poster art...and thrilling for a Jurassic Park fan. Keep up the awesome work! Love the art! You had mentioned the upside down vehicle was a Jeep, but with the 04 decal and missing tire, it reminds me more of the Ford Explorer from the T-Rex attack.... no? Whichever the vehicle... thanks for letting me geek out a bit. regardless, this poster is AWESOME! As a HUGE JP fan I LOVE what you've come up with! The posters are drenched with nostalgia factor! I love most that you included bits from the first film (both with the vehicle and color scheme), and how you incorporated the more 'ominous' feel of the story; the history of the original park being shrouded in 'darkness' and mystery, while a new park is being almost 'naively' constructed in its place, all while the remains of the original park is still present.. a part of the island. I'll probably bug yah on all social media fronts, but this piece is amazing, I love your work, have met you, had stuff signed in person.. but I fear this print is totally unattainable. People followed the JP truck around not appreciating your work nor screens in general. Talked to the helpful guy who runs some aspects of your blog, they're trying to make the drops better.. is there any way you can help with this? I'd love it on my wall, and as you've reached out to your fans in the past I figure I'd give it a shot! Brilliant work, very faithful to the feel of the original movie while bridging it with the new. Love this poster and the description/development of it. I just wish that you could send some to the UK. Or you could just send me a signed one of course! Hadn't heard of your site/work before now but I'll definitely be watching in the future. 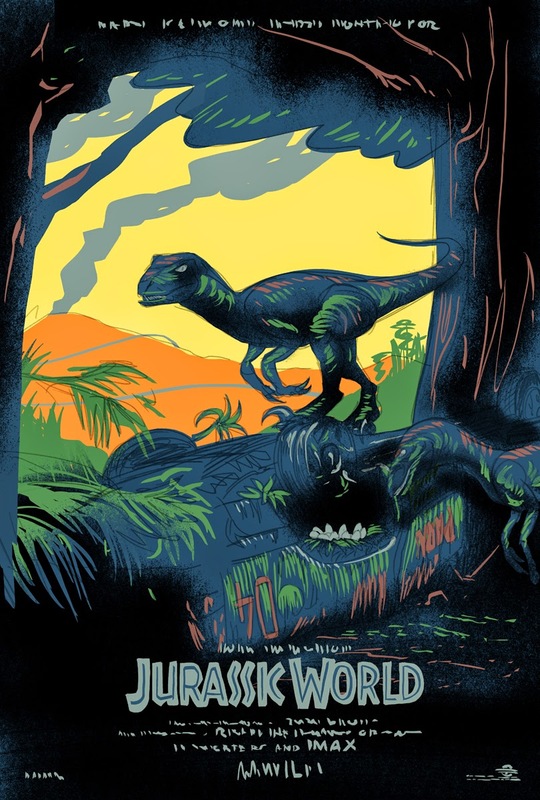 Excellent and beautifully captures all things "Jurassic"! It's very refreshing to see movie poster artwork that isn't the typical contemporary touched up photo collages. Batman (1989) and ironically Jurassic Park ushered in the less is more of movie poster design. I preferred the poster art by greats such as Richard Amsel, Tom Jung, Drew Struzan. Thanks for your work! Jurassic park was one of my favourite childhood movie. Thanks for sharing this post. Definitely it was such a wonderful blog, to the point that I have refreshed.. Very Interesting,your article made a huge impact on my thinking.tag heuer jacket As you mentioned that good sewing skills makes a huge difference,I never think about that before.keep it up,you are doing great..